An all-female crew of young filmmakers from West Lothian won Best Film with their debut short film, The Old Lie at the First Cut! Youth Film Festival in Ireland on Saturday 23 April, 2016. The filmmakers aged 15-16; Bethan Dow, Megan Houston, Dana Martin, Mari Wall, Taylor Thompson and Eilidh Anderson, were brought together by Livingston-based Firefly Arts, who offer theatre skills, film and drama activity for children and young people aged 5 to 25 years across West Lothian. 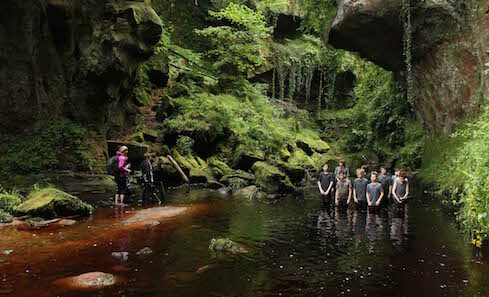 Shot in Glasgow, The Old Lie is an experimental dance film, featuring a cast of all-male dancers from Overdrive Dance Company aged 10 to 14, which explores themes of war and innocence, taking inspiration from Wilfred Owen’s classic poem, Dulce et Decorum Est. The all-female crew were brought together by Firefly Arts’ project A Word in Your Ear, a youth arts programme offering participants the chance to explore the politics of language, narrative and expression; to build confidence, skills and aspiration, and promoting the talent of children and young people across West Lothian. The project is supported by Creative Scotland through CashBack for Creativity and actively seeks to engage participants who are vulnerable, marginalised and do not currently participate in the arts. Firefly works closely with local partners, behavioural and disability services to ensure that participants with additional support needs can participate fully and equitably. This was the first short film for all of the young filmmakers who were involved at every stage of the production process from planning shots to post–production. The film has already received a host of positive reviews most notably from American musician Tom Waits who gave consent for his song Hell Broke Luce to provide the soundtrack to the film and sent a message of support to the group. Laura Black, Arts Officer, Cashback for Creativity at Creative Scotland said: “It was an inspiration watching this fantastic film and speaking to the young women and their supporting dance partners at Overdrive Dance Company about their hard work and dedication in its production. The First Cut! Youth Film Festival provides the opportunity for young filmmakers aged between 12 and 24 to come together in a vibrant festival atmosphere, whilst also giving them the chance to network and showcase their work. As well as the screenings of works by young filmmakers, the Festival will also include workshops, performances and the rare opportunity for young filmmakers to learn from, and engage with the professionals. Read our interview with the filmmakers behind The Old Lie. Cast: Ryan Aptomos, Charlie Scott, Luc MacDonald, Sean Brown, Calvin Wilson, John Selkirk, Ewan Chanter, Scott Sinclair, Neil Gibson, Zack Pye, Anthony Tetlow, Adam Quinn, Roddy Gilkison and Benjamin Connolly. Supported by: Rosie Reid, Geraldine Heaney, Claire Grinis, Firefly Arts Ltd, Creative Scotland and Cashback for Creativity.